The Lord’s Ministries-Kenya. The New Hope Christian center is a church called to awaken believers in the Body of Christ through Revivals and awakening/ strengthening the local churches. We have witnessed thousands of people come to the Lord through the Revivals we are hosting in our churches. Many people have been healed and others delivered from demonic oppression. It has been our desire that we see the fire of the Lord come down and transform the lives of Many. Establishing the Community based projects to let people see the love and compassion of Jesus Christ that God has for them. 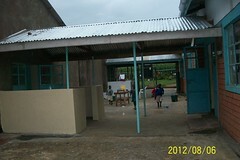 Some of the already existing projects include:- Bridgeway Academy a school for the orphans which has 70 kids now. We are also praying and trusting God to build a home that will care for the homeless/ Orphans. North Carolina Baptist Men- Baptists on Mission. The purpose of the North Carolina Baptist Men (NCBM) is to help Christians share the love of Jesus by praying, giving, going and becoming actively involved in missions with their time and talents. NCBM strives to make Christians aware of human needs and to provide opportunities to help meet those needs wherever they exist. This website is filled with ideas, resources and projects that will help you and your church go (Projects), learn (Missions Education, Training, Events), Give, and Pray for missions. Pinnacle Converting Equipment- Machine design and build company. Founded by Bob and Kathy Hillebrand. Since 1995, Pinnacle Converting Equipment has been a leader in providing standard and custom-built converting machinery and contract converting services to a myriad of industries worldwide.